Roasting vegetables is one of the easiest and yummiest preparations you can do. I thought I was making enough veggies for leftovers, but they were so good we polished off everything. a small handful of herbs – thyme, rosemary, marjoram, etc. Preheat oven to 400 degrees. Combine first 5 ingredients in a large bowl and toss with olive oil and a good pinch of s&p. Spread in a single layer on a baking sheet and place into the oven. Stir the veggies around every 10 minutes or so. Meanwhile, combine the broccoli, shallots, and garlic and toss with more olive oil, s&p. Once the veggies are pretty much done (about 25-30 minutes) toss in broccoli mixture and cook for another 10 minutes. While the broccoli is cooking, toss arugula with some balsamic and s&p and arrange on the bottom of a plate. 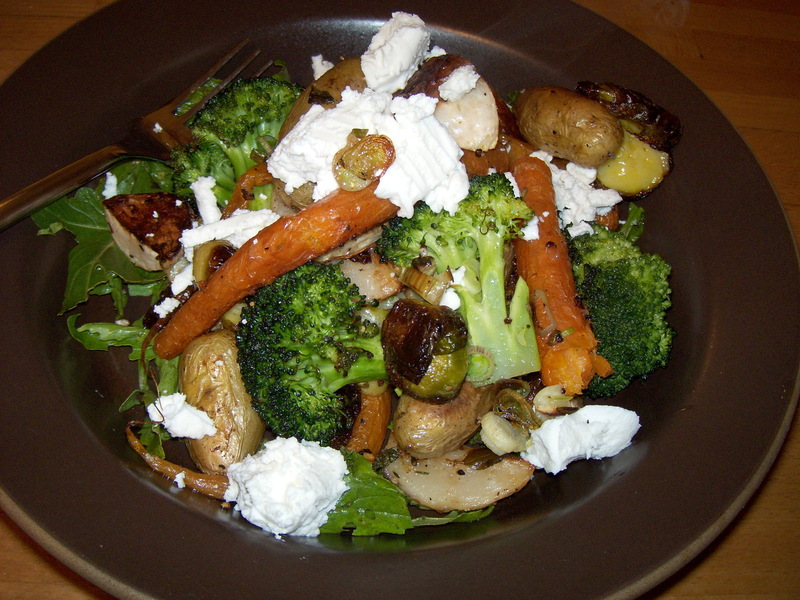 Place roasted veggies on top of arugula and top the whole mess with some goat cheese. Looks delish, and I love your description of “the whole mess”.